Let us get this out of the way right now, Firefight is not Close Combat. This is not a knock on the game, but a factual statement. I have played most of the Close Combat games down through the years, and Firefight does some things that I have never seen in Close Combat. The game is aptly named. In Firefight, you can have long lasting offensive and defensive fire going on without suffering huge amounts of casualties. 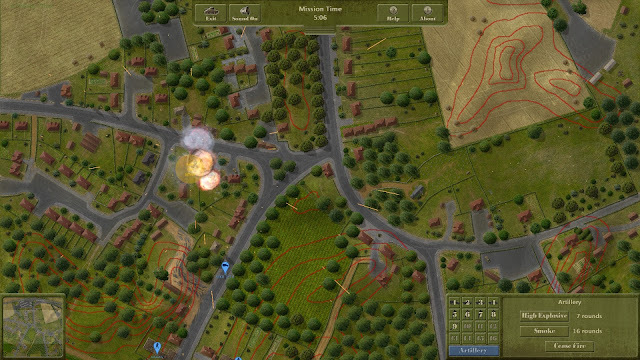 A British unit was under fire for five minutes of real time playing, and never suffered one casualty. 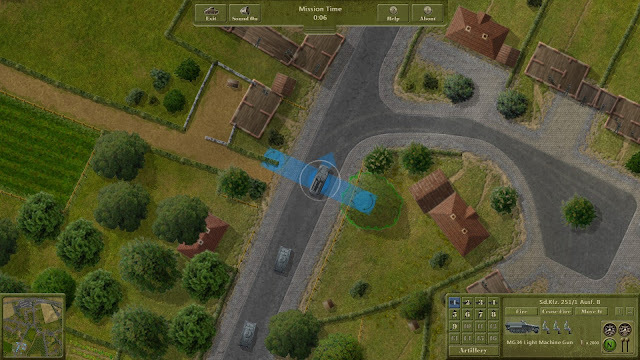 Your troops in the game will search out and use cover as well as any I have seen in tactical games. There are nine maps with eight scenarios you can use on all of the maps. 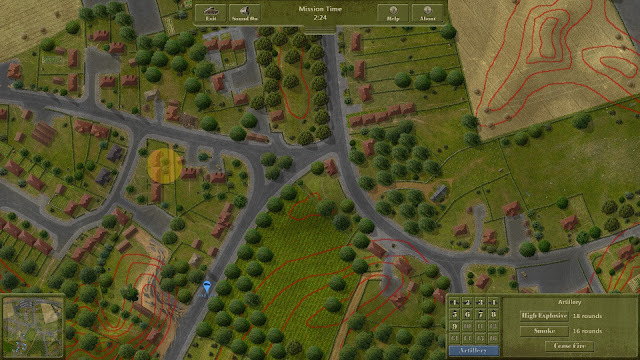 There is no scenario editor, but the eight scenarios cover all of the years from 1939-1945 on the Western Front. So you get to play with a large amount of different troops and weapons. You hold down the right mouse button to scroll around the map. It has just been updated to version 1.1. One of the new new features is the mouse arrow showing the terrain height at that spot. You also get a summary at the end of the game now with a ranking between zero to three stars. You have the ability to zoom out to actually get red terrain height lines superimposed on the map. The artillery strikes are conducted by picking a spot with the left mouse button and holding it down until the mission ( high explosive or smoke) is selected. You will then see a circle with the words 'adjusting fire' in the spot. Spotting for artillery does not need a ground unit to be able to see the area. It works as if you are in a artillery spotting plane flying over the battlefield. 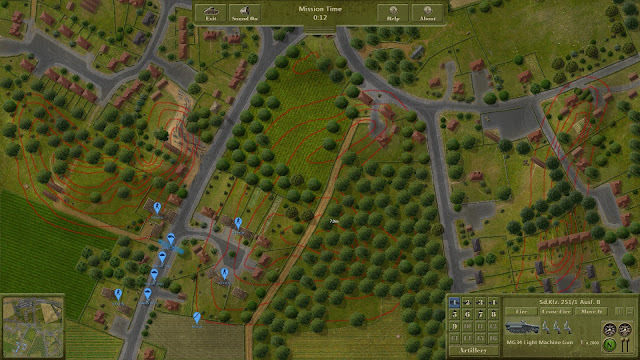 Your guns will fire a few spotting rounds and then let loose a barrage of shots on the area, so your artillery strikes can be used up quickly if you are not paying attention to them. The only commands you can give your units is to move or fire. This doesn't mean they are sitting ducks while you are busy with another part of the battlefield. The AI in your troops, as well as the enemy, is very good. The sounds in the game are excellent. The sounds of the artillery strikes and regular weapons just seem right. The only con is that you can only have the sound on or off. The con part of that is when moving your troops you will most likely get a shouted "MOVE" in your ear, which does get tiring after a while. This game started out as shareware in the 1990s and in some ways shows it's pedigree. It is a one man programming show, so do not expect to see a game released by a huge company. The visuals are fine for the game, but not up to some of today's standards. As a game for us grognards it is just fine. For someone who started playing wargames on a Commodore they look pretty good. The game right now is only $9.99 so it is a good bargain. The programmer has always been working on this labor of love, so it is possible to have more added to it in the future. A scenario editor would greatly expand its life expectancy on peoples' hard drives. This would be a great game for wargaming newbies to get into. The simple commands, and the fact that your troops won't die immediately with a boneheaded move on the players part, would make this an excellent first tactical wargame. The price tag adds to the attraction.